One of the challenges that I face in working on this craft at home is that my space is definitely less than desirable when making and aging cheeses. Having a dedicated space that is consistently organized to where I can make and experiment with the various recipes that I follow is difficult to say the least. I am here to tell you however, that it can be done…even in a small, one bedroom apartment…in the middle of the summer. Chevre is pretty easy to make. I take nothing away from all of the cheese makers across the country and abroad that devote their time in refining their recipe. As far as the actual cheese making equipment are process is concerned, there are very few steps. I buy pasteurized goat’s milk from Whole Foods. If you are planning on making cheese from raw goat’s milk, you need to start almost as soon as the goat’s are milked. The longer you wait, the greater chance there is for contamination. Because this is an issue with any fresh cheese sold in the United States, all fresh chevre (as far as I am aware) is made from pasteurized milk. Pasteurization takes the guesswork out of this and allows the fresh cheese to be packaged and sold within a week. I buy my milk from Whole Foods. 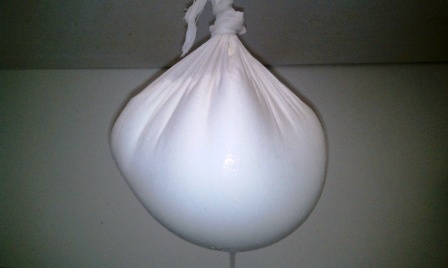 It may be a bit pricey, but a 1 gallon batch makes a fair amount of chevre at the end of the process. Pour the gallon of milk in your sterilized pot and slowly raise the temperature to 86°. At that point, shut off the flame, incorporate the culture thoroughly with your stainless spoon, cover and…that’s it… Make sure that the pot is in a place that will remain above 72°, and leave it alone for 12 hours. 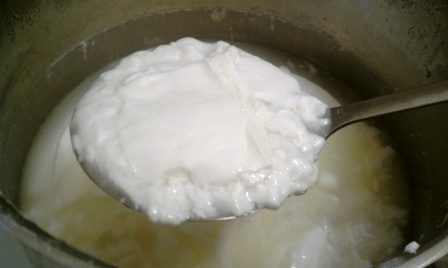 After 12 hours, the culture and rennet will react with the lactose in the milk forming a mass of solid curd that will take on the shape of your pot. There will be a good deal of whey in your pot as well. 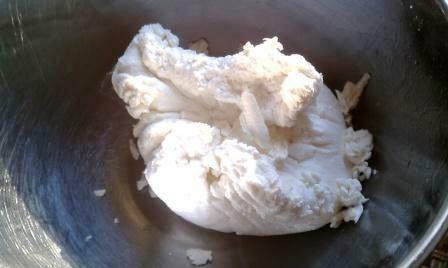 You can pour some of that off in order to expose as much of the white, soft curd. Line a colander with a large piece of cheese cloth, take your stainless spoon and start ladling thin layers of curd directly into the cheese cloth. By scooping thin layers of curd with your ladle or spoon, as opposed to dumping everything right in, you will trap more whey within the curd which results in a moist chevre. As soon as all of the curd is within the colander, tie up the corners to create a bag and hang in order to drain for approximately 6-12 hours. I leave one end of the cheese cloth quite long so that I can attach it to various areas around my apartment. During the winter, I may wrap the long end around one of my cabinet fixtures and let it drain into the sink. During the summer months, you need to keep your temperature in mind. We don’t have an air conditioner in our kitchen, so it can easily top 80° in there. Much too hot for a fresh cheese to ripen in my opinion. We do have an a/c in our bedroom, though. So I pull out a dresser drawer, wrap the end around a handle, and let it drain into a bowl on the floor. Classy? Maybe not… Does it work? Yes! 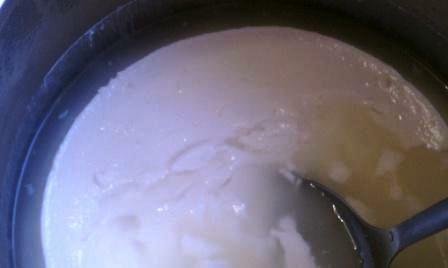 After about 8 hours, the curd comes together to form a solid mass. The amount of time depends totally on what sort of texture and mouthfeel that you like. The longer you drain, the drier and more chalky your texture will be, while a shorter period of time will result in the reverse. That’s it…. the process in a nutshell. 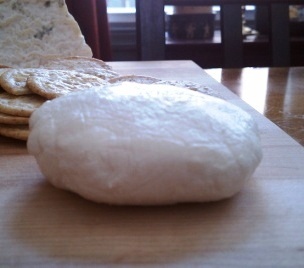 Fresh goat cheese is so quick and easy, and yet so satisfying that everyone should give it a try at least once. If I can do this in a small and hot apartment in the middle of NYC, and still get great results, you can too… Trust me. This is fantastic!!! I am trying this as soon as we get home. Mags and I are crazy over a store bought version of goat cheese. Now I get to try to recreate it. I’ll let you know how it shakes out. That’s great Kevin! Let me know how it turns out!